Here at the Schenkkade, opposite the former Liduinakerk, the Dutch soccer team once trained. 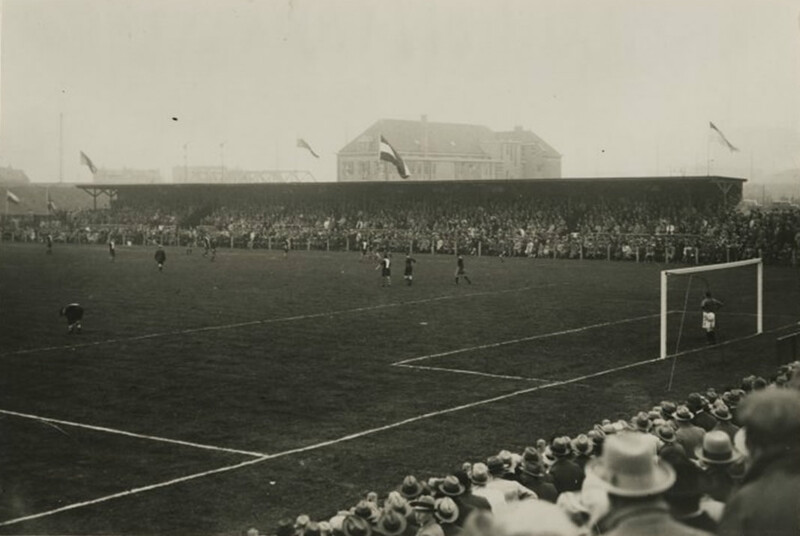 The wooden stadium of Soccer Association V.U.C had artificial lighting, the first in Europe! A view of the Schenkkade and the Liduina Church with the V.U.C. football field in the foreground (1930). Major damage to the Schenkkade. 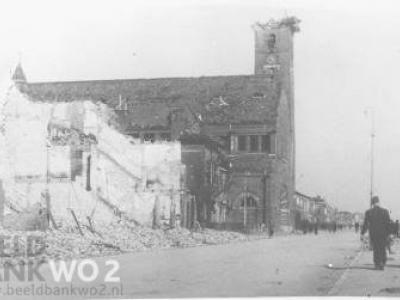 Damage to the Liduina Church after the bombing. 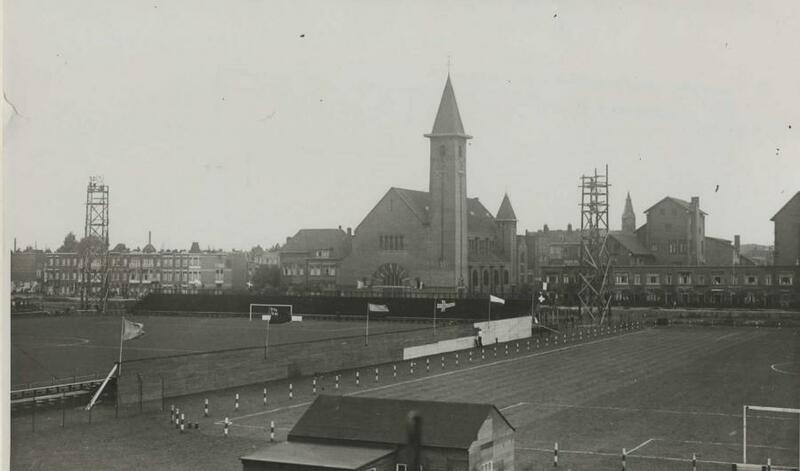 The Schenkkade, opposite the houses, was around 1945 a green area with a football field. Now it's full with offices. The grounds opposite the church were used by the V.U.C. football club from 1930. It was one of the first football fields in the world to have artificial lighting. 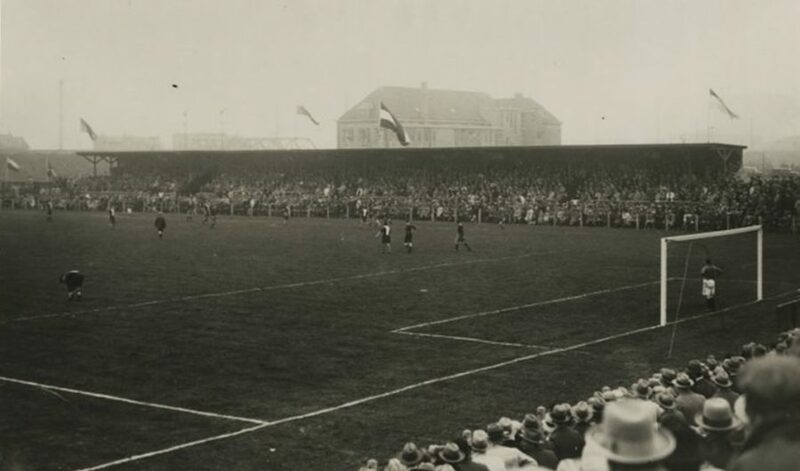 The evening matches and the Dutch team training sessions drew great crowds to the field. V.U.C. 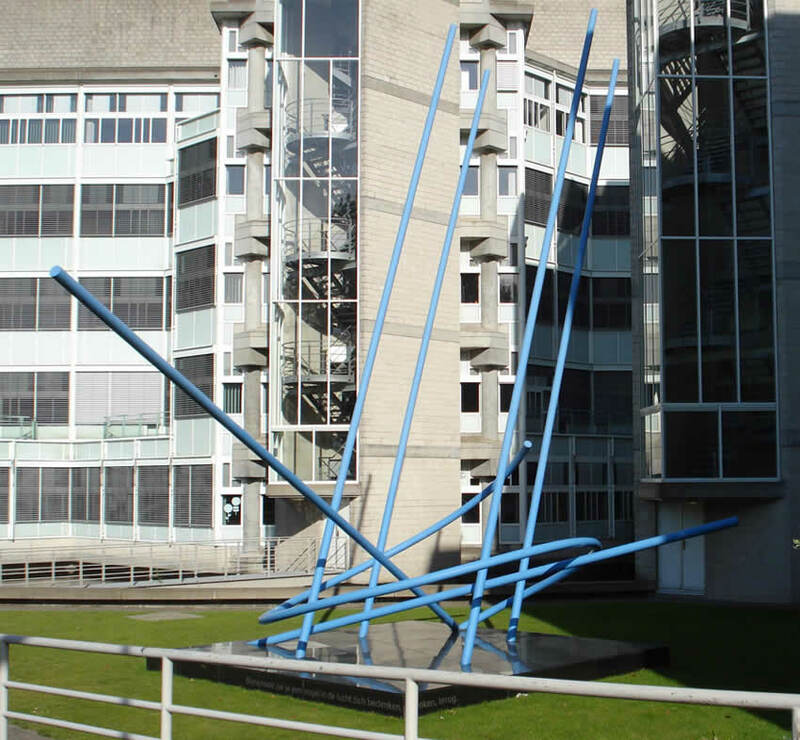 moved to their current location in Mariahoeve in 1968. Offices were then erected on the vacant site. The large church to the left of the row of houses - which are still there - is the Roman Catholic St. Liduina Church. 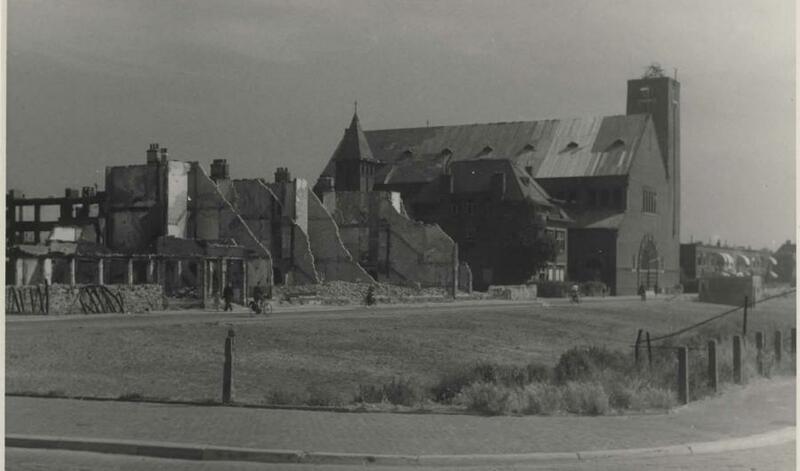 This was opened in 1926 to look after the increasing number of Catholics in the expanding neighbourhood of Bezuidenhout and Voorburg-Noord. Both the church and the school in the Amalia van Solmsstraat were named after Saint Liduina van Schiedam (1380-1433). The vicarage was situated to the left of the church. 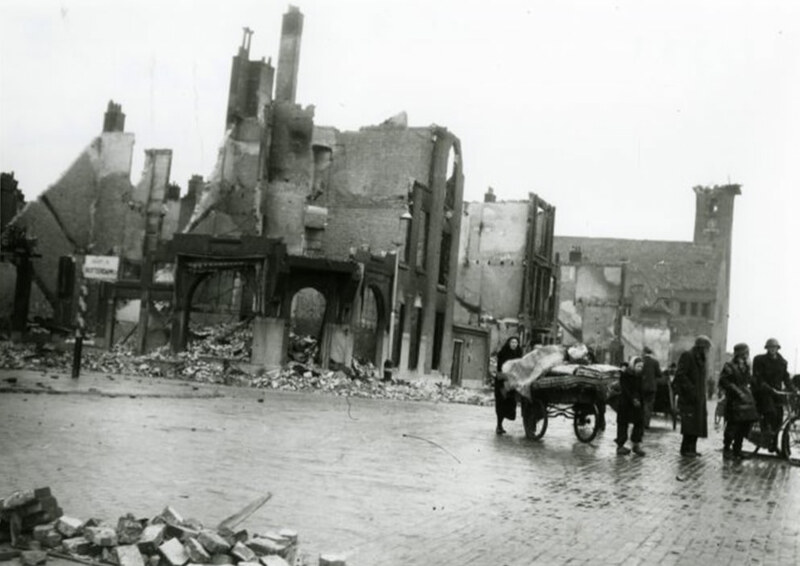 The church was badly damaged by the bombing, but not destroyed. 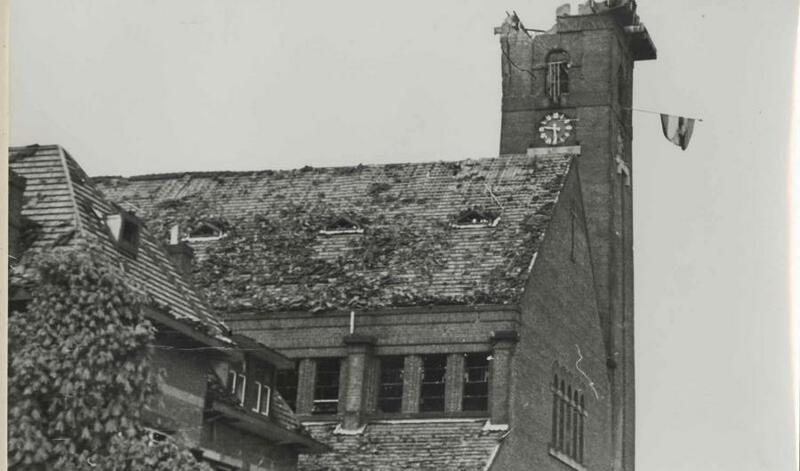 They made makeshift repairs to the roof, which was the most badly damaged, using wood from the church floor. 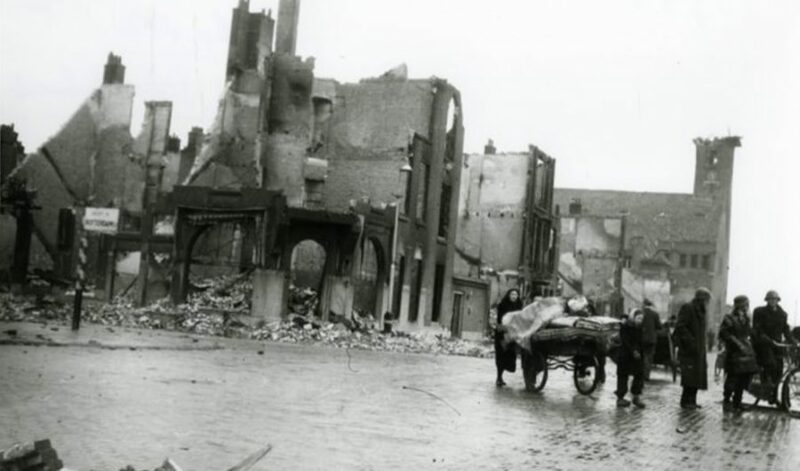 The building was restored after the liberation, but the tower that was destroyed in the bombing never returned. The end for the church came in 1977 when the building was demolished to make way for an office block with a church hall at the bottom. Mr P. Verreck, 15 years old at the time of the bombing. During the war the soccer teams of HSV V.U.C. and HBS Craeyenhout played together on these green fields. During the war the German army collected the bells of churches for the production of ammunition. People returned to collect what was left. 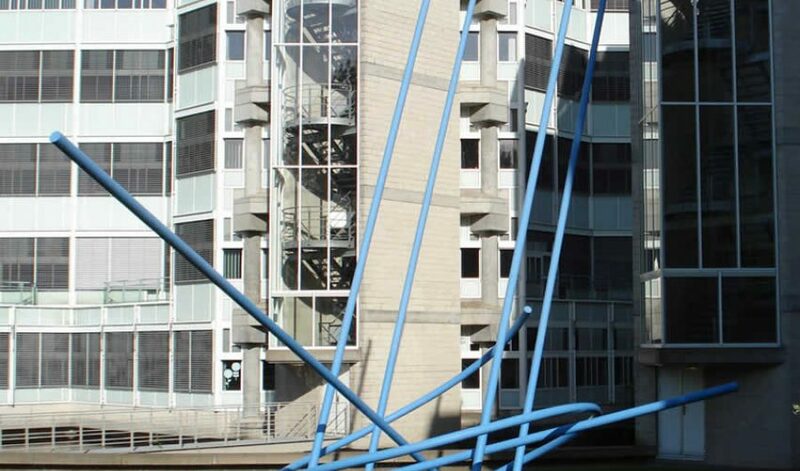 This memorial symbols the lines of bombing at 3 March 1945.